This film highlights how Uganda National Health User’s/Consumer’s Organization took initiatives to empower communities to negotiate for their health rights. This video is on accountability lab is facilitated by Dr. Abhijit Das from Centre for Health and Social Justice aiming to bring clarity among practitioners on the various perspectives on accountability. This video material was prepared as part of the project "Introducing drug-related treatment for children", implemented by HOPS - Healthy Options Project Skopje. The video was filmed during the study visit to Vienna, which took place from May 12 to May 14, 2013, attended by representatives of relevant institutions of the Republic of Macedonia working in the field of treatment, rehabilitation and re-socialization of drug users. "Dialog Gudrunstraße", which is working on treatment, rehabilitation and re-socialization of children who use drugs for several years, hosted the study visit, and the participants also visited other institutions in Vienna specialized for drug addiction or youth care. The objective of this video material is to be used for sharing the experience with other representatives of relevant institutions included in the social and health system of Macedonia and to help in resolving the problem with children who use drugs. Health related expenditures have been identified as one of the major causes of rural impoverishment in many developing countries including India. The declining financial resources allocated by the state has resulted in forcing people to pay from their pocket for health care even as the unofficial and informal payments continue in whatever public health services that are still delivered. The inadequacy shown by the community in asking any question on the functioning of the health system and more so regarding the utilization of the financial resources in health such as untied funds to the PHC, sub-centre and to each of the Village Health Nutrition and Sanitation Committees (VHNSC) or the disbursement of Maternal Protection Scheme (Janani Suraksha Yojana -JSY) etc., has been a critical area which needed intervention. The community monitoring and planning advocated by civil society and also promoted by the government under the National Rural Health Mission (NRHM) has yielded positive results. However, it has been an uphill task to include the issues of health budget and flow of money into the processes of monitoring which is a challenging task. This documentary captures such an effort done in 12 villages of Bolangir district, Orissa State, India where community is taught as to the money that is allocated to various schemes at the community level to deliver health entitlements. Such demand for accountability is done while the community is actively engaging with the public health system within the larger processes of community mobilisation and monitoring to demand accountability from the health system. Our Health Our Money, a film produced by CHSJ showcases the work done in Odisha around decentralised monitoring of health expenditure. The film is 25 minutes, with English subtitles. Common people are presenting evidence on the shortcomings of public health services. They are working for removing these shortcomings, and are making health services accountable in relation to issues raised by them. We must admit that all this is unprecedented. This is happening because of the process of Community Based Monitoring (CBM) which is bringing about a new awareness about health services. We are showing a glimpse of this process briefly through this film. This film was produced by SATHI. NRHM Community Based Monitoring is implemented through AGCA..
A short video clip on empowering rural indigenous communities in Guatemala to participate in health planning and undertake community monitoring demand accountability from public health authorities. The video clip was produced by CEGSS, Guatemala. 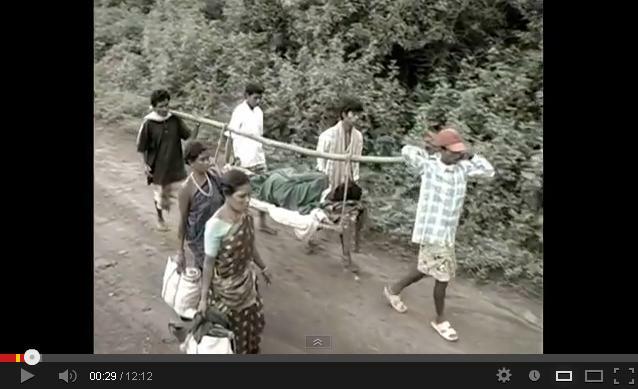 A short video clip on community based monitoring of health services under National Rural Health Mission in India. This film was produced by CHSJ. NRHM Community Based Monitoring is implemented through AGCA.